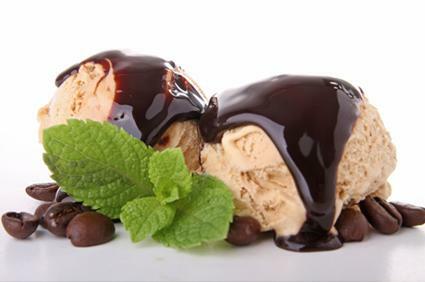 Italian coffee and gelato have one thing in common; both are prized for their clean, intense flavors. Just as gelato is crafted to allow the fullest expression of flavor, rich espresso is created to be equally strong. Combining these flavors into a refreshing dessert simply requires a good recipe. It takes longer to make gelato than ice cream since you need to create a thick base before freezing. Leave yourself plenty of time to craft this dessert ahead of time because rushing will only lessen its intensity. Gelato is crafted to bring the most intense flavors and a velvety texture to the dessert, so make sure you get the best results by choosing high-quality ingredients such as gourmet espresso powder and farm fresh eggs. In a heavy saucepan, heat the half and half over medium heat, stirring slowly and continuously, until it begins to bubble around the rim of the pan. While the half and half is heating, combine the egg yolks and sugar in a mixing bowl and whisk them well. Once the half and half begins to bubble, remove the pan from the heat and gradually mix small amounts into the egg mixture until all the half and half is incorporated. Stir the espresso powder into the hot water, and then stir it into the egg mixture. Stir in the vanilla and optional coffee liqueur. Rinse out the saucepan, wipe it dry, and pour the egg mixture back into the pan. Stir the contents over medium heat for approximately nine minutes until it reaches a custard consistency, but don't let it boil or it will scald. Refrigerate the mix for two and a half to three hours until it's completely cold. Transfer the mixture to an ice cream maker and freeze according to the machine's instructions. This recipe serves about four people, depending on the serving size. While gelato by itself is a treat any day, dress it up with any of these other variations. Serve the gelato in a tall glass and pour hot espresso on top to make your own version of an affogato. Drizzle fresh chocolate sauce on top and serve with biscotti on the side. Top with freshly-whipped cream and serve alongside a cup of hot espresso. Break pieces of pizzelle into quarters and insert a section into each serving. Coffee gelato is perfect any time you desire a refreshing, intense hit of coffee flavor. Serve some as an after-dinner treat, or you can enjoy a little of this luscious dessert whenever you like. After all, life is too short to pass up spoiling yourself once in a while, so go for it.